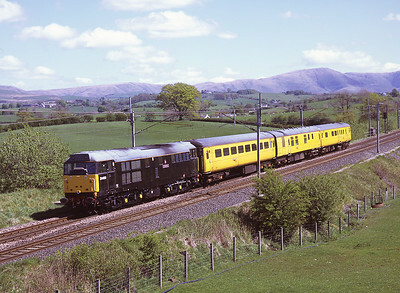 For a short time EWS experimented using shunters on the short trips between the lime works at Hardendale and Harrisons. 09020 was caught in early morning action on 26/5/04. 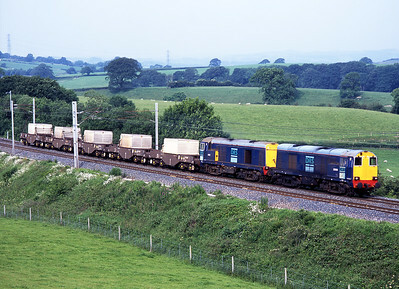 20309+20303 pass Hincaster with diverted flasks 31/5/11. 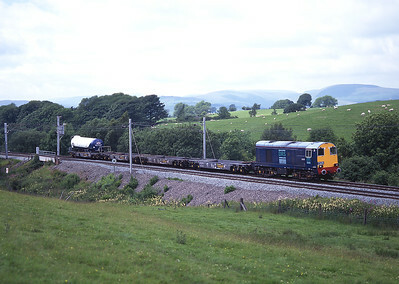 After another class 20 failed further south, 20301 worked the DRS milk train solo on Sunday 6/7/97, seen here near Hardrigg. 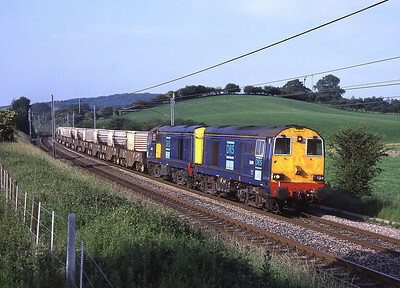 20309 + 20307 head a diverted monster flask train (load 9) near Sedgwick 30/6/06. 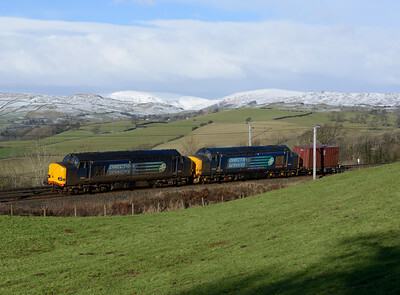 20305+37609 haul the Saturday Sellafield-Crewe past Beckfoot 24/1/15. 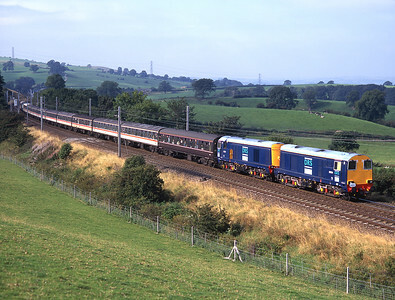 A Bristol-Newcastle railtour passes Lambrigg behind 20304 + 20305 14/9/96. 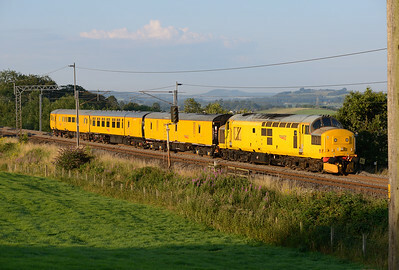 20305 + 20301 pass Lambrigg with a diverted flask train on 1/7/06. 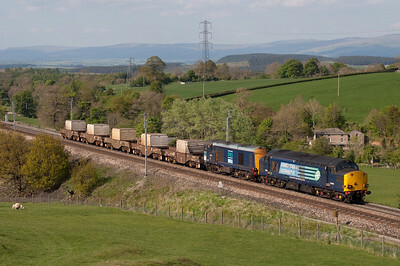 20309+20304 worked a container from Sellafield-Crewe via Shap 14/9/13 seen at Hayfell. 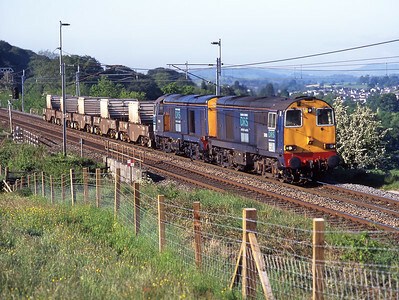 20313+20306 head north from Oxenholme with a diverted flask train 2/6/06. 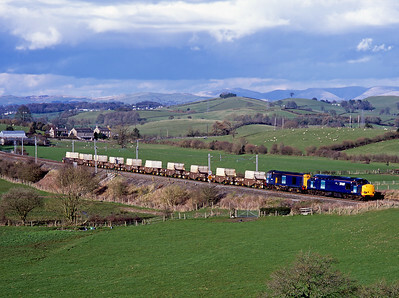 During 2006 Sellafield traffic was diverted over Shap while Leven viaduct was repaired. 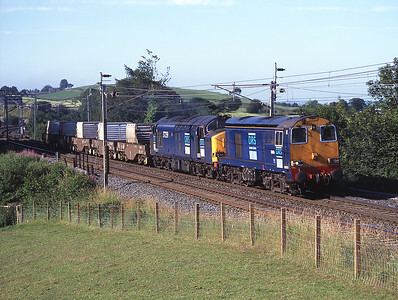 20306 + 37259 are seen at Hayfell 14/7/06. 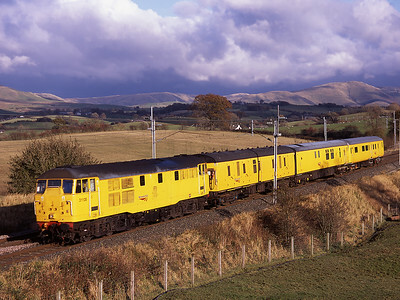 31285+97303 pass Docker with a Mossend-Derby test train 30/10/10. 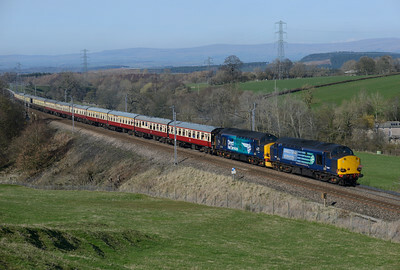 31459 and 31285 top and tail a Derby-Mossend test train 8/3/10. 31105 passes Docker with a test train returning to Derby from Polmadie on 1/11/08. 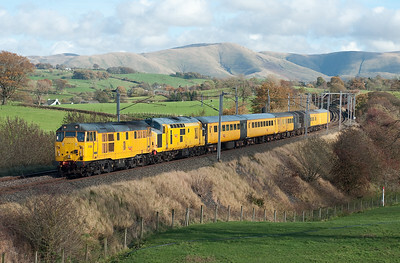 31459 propels a Network Rail test train past Docker 11/5/09. 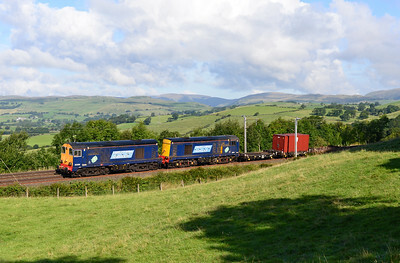 31601 "Devon Diesel Society" hauls 50007 "Hercules" and 50017 "Royal Oak" through Oxenholme 2/8/15. 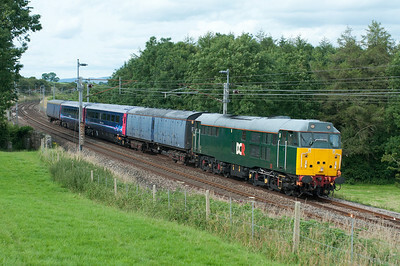 The locos were returning from the Bo'ness & Kinneil Railway diesel gala. The promised sunny day soon became a cloudy day... 31601 passes Hincaster with a Kilmarnock-Old Oak Common stock move 21/7/12. 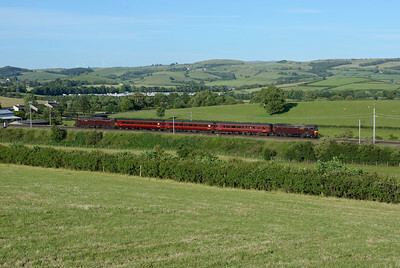 At the end of another day on the Windermere shuttle, 33029 & 57316 pass Hincaster with the empty stock to Steamtown, 24/6/18. 33029 & 57316 top & tail the Windermere stock returning to Steamtown at Woodhouse on 22/6/18. 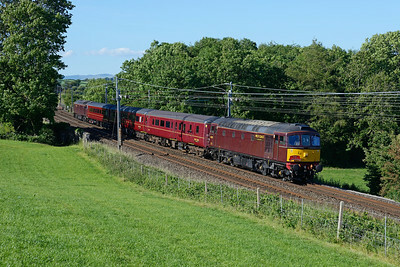 37608+37601 haul the Cruise Saver ECS from Kingmoor to Crewe near Oxenholme with 47810 on the rear, 7/5/12. 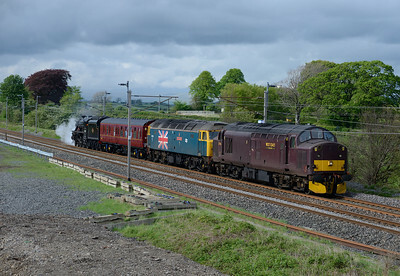 37607+37218 storm past Great Strickland with Pathfinder's Easter Chieftain returning from Inverness to Eastleigh 6/4/15. 67612+37419 pass Hayfell the Saturday Sellafield-Crewe container 31/1/15. 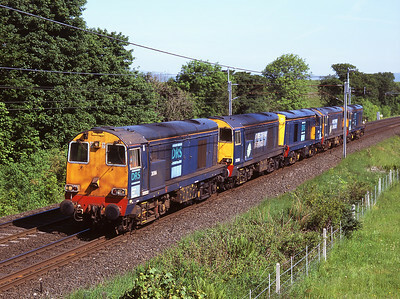 37607 + 20313 haul a mega flask train past Rowell 19/4/06. 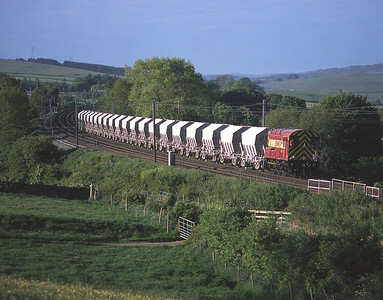 The train was diverted whilst the Leven viaduct was being reconstructed. 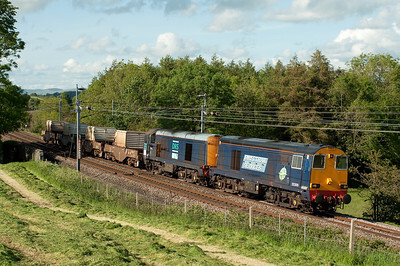 37059+20303 haul the diverted 6K73 flasks past Great Strickland 3/5/11. 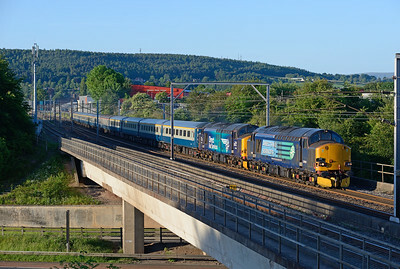 97303 heads north from Oxenholme with a Derby RTC-Carlisle measurement train at 06.45 on 25/7/14. 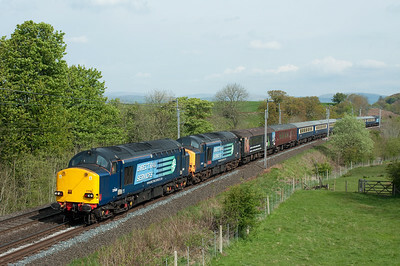 A lucky patch of brightness at Elmsfield as 37706 hauls 47580 "County of Essex" and Black 5 45231 "The Sherwood Forester" from Shap summit to Carnforth on 11/5/14. The steam loco had failed there 2 days earlier. Sadly running 40 minutes late due to a loco swap at Carlisle, 37602 & 37609 storm past Penrith with the Fort William-Crewe "Three Peaks Challenge" charter 17/6/17.